Community stakeholders attended an open house Wednesday night focused on the ongoing Department of City Planning rezoning study of the Flushing West area. This was the second open house event held by the Department of City Planning for the Flushing West planning study. For most of the participating community members, the hottest topic of the night was affordable housing and how much of it would be available with an increase of residential development. Hyun-Jung Kim — an engagement coordinator at the MinKwon Action Center, a Korean American community-based organization — said the center’s biggest priority is to fight for the affordability of housing for the most vulnerable populations. This includes senior citizens struggling to remain in their homes, low income families being priced out of the neighborhood and community members with limited English skills. John Choe, executive director of the Greater Flushing Chamber of Commerce, said that he believes changes in Flushing West are long overdue. According to Choe, many issues in the area — from transportation upgrades to affordable housing — have not been adequately addressed over the past two decades. Ken Cohen, president of the NAACP’s Northeast Queens division, added that although the Flushing West planning study has shown that 71 percent of the target area is of Asian descent, there are still issues which concern his organization. While affordable housing is a priority for many of the forum’s attendees, there are also environmental factors involved in the Flushing West Planning Study. Alexandra Rosa, consultant for Friends of Flushing Creek, was there to talk to representatives of the Department of Environmental Protection (DEP) about increasing efforts to clean up Flushing Creek. According to Rosa, one billion gallons of raw sewage and storm water runoff is dumped into the creek each year — and the group takes issue with a DEP plan that would continue the practice of releasing sewer overflows into the creek. “Friends of Flushing Creek is committed to help publicize the need for and to get projects that will actually make Flushing Creek a recreation destination, and to clean up the pollutants,” Rosa said. Information on the study’s progress can be found on the Department of City Planning website. 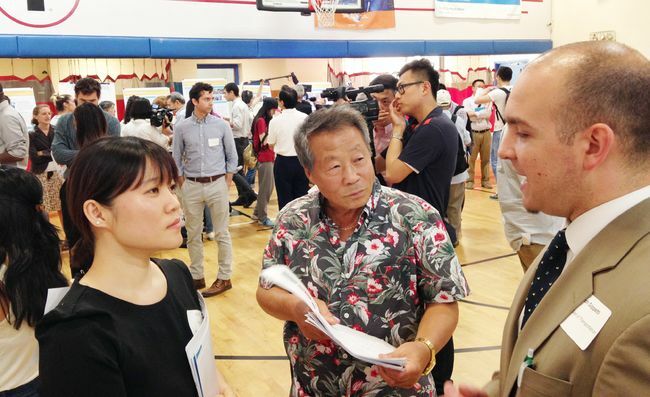 The next open forum on the Flushing West study will reveal the results of public feedback received by Department of City Planning from previous open house events, and is planned for Aug. 20.